→What Are the Best Garden Hose Reels? One of our top picks for a garden reel hose is the Rapid Reel Two Wheel Cart. You need a garden hose reel to keep your hose from turning into a twisty, messy pile. You can divide hose reels into two major categories: carts and hideaway boxes. Whether you want a cart or a box depends on how much you mind seeing the actual garden hose everyday or not.Â Whichever one you like, we’ve got even more options available to you, which you can find below. After choosing the best hose for your gardening needs, the next decision you need to make when it comes to watering tools is how to store that hose. It’s true that you can leave your hose lying loose on the ground or tossed in a heap in the shed. But wrapping the hose around a hose reel will go long way towards extending the life of the hose and towards saving your sanity. If you’ve ever had to deal with a kinked, twisted or otherwise damaged hose, you might fully appreciate the benefits of a hose reel and reel accessories. One thing you might notice when looking at garden hose reels is that some of them are designed to look pretty or to cover up what some might consider to be a very a utilitarian looking hose. Others don’t look so great, but promise to make up in function what they lack in looks. Different styles of garden hose reel are meant to work for different gardeners and different gardens. One popular style is the “hideaway” hose reel. Often shaped like a box, it features a spool on the inside for winding the hose around. When your hose is fully wound, you won’t see any part of it. Some hose reels are metal carts. They feature a frame and a spool, as well as a crank or some sort of winding mechanism. This cart hose style of reel might not look pretty, but it performs its basic function well. Another common garden hose reel style is the wall mounted reel. This wall mount style can be very convenient, as the mounted hose is always stored right next to the spigot and is up and out of the way. Of course, a drawback of this style is that you’re limited when it comes to actually moving the hose. Within the main categories of hose reels, there is room for a considerable amount of variation. For example, some hideaway reels are made out of a plastic that is molded to look like a wicker basket while others are trying to imitate the style of picket fences. Metal carts might be plain and utilitarian or they might feature special details, such as engravings or decorative touches such as flowers or birds. How the garden hose reel looks is just one thing to keep in mind when picking out the best one for your yard and garden. Another important consideration is the length of the hose you’ll use it with. Different types of reels can handle different lengths of hose. You don’t want to purchase a reel that can only hold 50 feet worth of hose to pair with your 100-foot hose, for example. It also doesn’t make sense to invest in a reel that can hold up to 200-feet of hose, when your garden hose is just 25 feet long. Where your garden is in relation to the spigot can also influence the features of your reel or its style. If your garden is 50 feet away from your house and the water source, it doesn’t make sense to purchase a wall mounted reel, since you’ll need to waste about 50 feet worth of hose just getting to the garden. It also might be easier to pick a reel that has wheels or that is otherwise easy to move if your garden is a considerable distance from the water source. That way, you can move the reel easily and don’t have to mount any fittings. 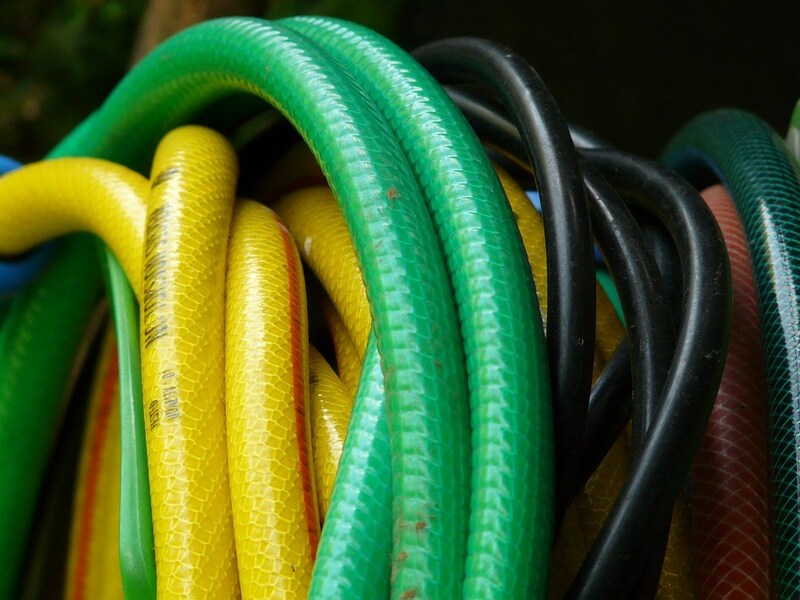 If you are planning on leaving the reel in the garden, it’s important to look at how long the lead hose or connecting hose is. Some reels have lead hoses that are 10 feet or longer, so the water source can be a considerable distance away. Others have short lead hoses, which means they have to live pretty close to the source of water. The materials the reel is made out of are also worth considering. Reels that are pretending to be wooden boxes or wicker baskets are often made out of plastic or resin. In some cases, the plastic can be pretty flimsy, making it likely that the reel won’t survive for long in outdoor conditions. If the reel is made out of metal, find out if it’s a rust resistant metal. It’s going to be exposed to an awful lot of water, so you don’t want it rusting out after just a few weeks. Don’t forget to look at how the hose is wound around the reel. There are usually two options: a hand crank or an auto rewind feature. The hand crank option will require more power from you, but there’s also less of a risk that something will go wrong. Auto retracting or auto rewinding features are great, until they jam or otherwise break. A reel isn’t your only hose storage option. You can also choose to store a hose in a pot or on a rack. Both have their benefits and drawbacks. One drawback shared by both a hose pot and a hose rack is that there’s no easy way to wind up the hose. In the case of a rack, you’re left wrapping the hose around the hanger part. In the case of a pot, it’s up to you to carefully coil the hose around, keep it neat and kink-free, without the aid of a spool. Another potential conÂ of a hose storage pot is that it can fill with water, unless you put some drainage holes in the bottom. The stagnant water in the pot can make it a breeding ground for mosquitos. Usually, the biggest benefit to either a rack or hose storage pot is the pricing, they tend to cost less than a reel. If you’re on a tight budget, either option might be preferable. Otherwise, you might be better off picking out a hose reel. If you’re looking for a garden hose reel that seems to combine form and function, take a closer look at the Rapid Reel Two Wheel Cart. Once assembled, it’s small and sleek enough that you can easily tuck it away next to the water source and not call much attention to it. Since it has big, durable, 10-inch wheels, it’s also easy to wheel the cart out towards the garden if you need to. It includes a 5-foot lead hose, so you can move it a short distance away from the spigot. The cart is manually powered, which makes it not ideal if you’re looking for a reel with an auto rewind feature. But it’s worth noting the that crank is smooth and easy to turn. The only big drawback is that there’s no guide to hold the hose in place as you wind it, so it is up to you to make sure the hose doesn’t twist while you wrap it around the reel. The Rapid Reel Cart does have a high price tag. But it also has a 10-year warranty, which protects you from leaks, breakage and rust during the first decade of its life.